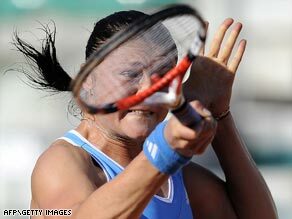 (CNN) -- World number one Dinara Safina defeated Russian compatriot Svetlana Kuznetsova 6-3 6-2 on Saturday to lift the WTA Rome Masters claycourt title. World number one Safina finally lifted her first tile of the season in her fourth final appearance. Safina never looked in trouble as she stormed to victory in an hour and a half as her seventh-seeded opponent paid for a string of unforced errors. The top seed also gained revenge for her 6-4 6-3 defeat to Kuznetsova in the final of last week's Stuttgart Open. It was Safina's first title of the season in her fourth final having also been beaten in the Australian Open and Sydney finals. Safina, 23, also won her first title as the world number one, a honor she only achieved on April 20. Having lost the first set in her previous three matches before digging deep to fight back, Safina admitted it was pleasing to have a less complicated match. "Finally I won the first set," she sighed. "Today she was giving away more unforced errors than she usually does. "I also played a little bit better. I was trying to get her off the baseline because she feels very confident there. "But when she had some chances she was really missing - a lot. In some moments I had to say: 'thank you very much'." World number eight Kuznetsova took only two of 11 break point opportunities while Safina converted five of her nine chances. "Last week I was dictating the game, I was serving well and I was not doing that many unforced errors," she said. "I was doing too much and sometimes not doing anything. So it was like a little bit like Christmas today. I was giving away too many presents." Fourth-seed Tomas Berdych will face Russia's Mikhail Youzhny in Sunday's final of Munich's ATP claycourt tournament after the Czech beat France's Jeremy Chardy in Saturday's semifinal. Berdych, who knocked out former world number one Lleyton Hewitt in the quarterfinals, beat Chardy 6-1 5-7 6-2 in one hour and 45 minutes, making full use of his powerful serve to hit ten aces in the match. Chardy rallied from losing the first set 6-1 to force four break points on Berdych in the second and the Czech player, ranked 28th in the world, finally cracked as the Frenchman, 40th in the world, levelled the match. But Berdych finished strongly and broke Chardy twice in the third to book his place against Russian Youzhny who recovered from losing the first set to beat Germany's Daniel Brands 3-6 6-3 6-4.